Viral fevers and viral hemorrhagic fevers mimic a wide range of diseases, which makes clinical diagnosis in patients difficult and often impossible. To enable the identification of pathogens and the diagnosis in each individual patient, sophisticated molecular diagnostics, serological methods and other techniques are required. Furthermore handling of patient samples containing pathogens of up to risk group 4 requires appropriate biosafety containment measures. These diagnostic and containment techniques and technologies are usually only available in stationary laboratories at hospitals, research institutes and national or international reference centres. In outbreak and epidemic situations however, diagnostics are often needed closer to the patients so that long distance transport of samples is avoided and the time to results shortened. Faster obtainment of diagnostic results means that clinical decisions can be made quicker and isolation measures can be taken appropriately. One solution can be the deployment of laboratories to the site of outbreaks, where diagnostic capacity is needed and historically the need for deployment of laboratories became necessary for viral hemorrhagic fever outbreaks (Ebola, Marburg and Lassa fever) in Sub Saharan African countries, since these viruses were discovered and caused sporadic outbreaks in sometimes remote regions were diagnostic laboratory capacity was not available. The European Commission`s Directorate General for Developement and Cooperation (EC DG-DevCo) funded the project "Establishment of Mobile Laboratories up to Risk Group 4 in Combination with CBRN Capacity Building in Sub-Saharan Africa" (Project reference: IFS 2011 / 272-372) from 2012 to 2015. Over the course of the project – which was coordinated by the Bernhard Nocht Institute for Tropical Medicine (BNITM) in Hamburg, Germany – three deployable mobile laboratory units for the detection and diagnosis of infectious pathogens up to the highest risk group 4 were put into operational readiness. The underlying concept of a modular and deployable mobile laboratory was developed by the leading partner for technical implementation of the laboratory units and training, the Bundeswehr Institute of Microbiology (InstMikroBioBW) in Munich, Germany, and has already been deployed to international training missions and to investigate outbreaks in the past. 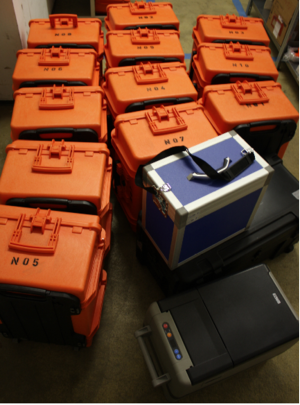 This modular and boxed system is adapted for outbreak response missions in Africa and Europe, is easily portable by persons and the three units were set up by the partners of the Bundeswehr Institute for Microbiology in Munich. One laboratory unit was established at the Institute for Lassa Fever Research and Control (ILFRC) at the Irrua Specialist Teaching Hospital (ISTH), Irrua, Nigeria. Lassa fever and other viral infections are endemic to parts of Nigeria. ISTH has been in close collaboration with the Bernhard Nocht Institute since 2007 in the field of Lassa fever diagnostics and research and is dedicated to high-quality molecular and serology diagnostics of Lassa fever. The second unit was established at the National Institute for Medical Research (NIMR) in Dar es Salaam, Tanzania, by the consotium partners of the National Institute for Infectious Diseases, (INMI, Istituto Nazionale Malattie Infettive) Spallanzani. NIMR was established in 1979 and has since then built a strong record of collaborations and in carrying out medical research and response to infectious disease threats. The third unit was established in Europe at the Bundeswehr Institute of Microbiology (InstMikroBioBW). This unit is staffed by the European partners of the EMLab consortium and was ready to respond to outbreaks that could not be reached by the two units in Africa. The unit was serviced by the team of the Bundeswehr Institute of Microbiology, who where also conducting the extensive and modular training program in order to prepare responders for field missions. All three laboratory units where deployed to the Ebola virus disease (EVD) outbreak in West Africa 2014 – 2016 and these missions were funded by the European Commission both through IFS 2011/272-372 and FED 2015/372-110. Two workshops were held in Africa, one in Nigeria and one in Tanzania, which dealt with the challenges of infectious disease outbreaks. Following the EVD outbreak in West Africa and considering the lessons learned, further field deployable laboratory units where set up ready for deployment, so that currently one additional unit is kept ready at the ILFRC in Nigeria and three at the BNITM in Germany.